to stand up to the Saudi government in seeking justice for Khashoggi. Virginia suburb just one month after his murder inside the Saudi consulate in Istanbul, Turkey. operation. Turkish leaders say he was strangled and dismembered. justice and will give his life, the ultimate sacrifice.” said Khashoggi’s friend, Dr. Esam Omeish. “Jamal was not a radical. 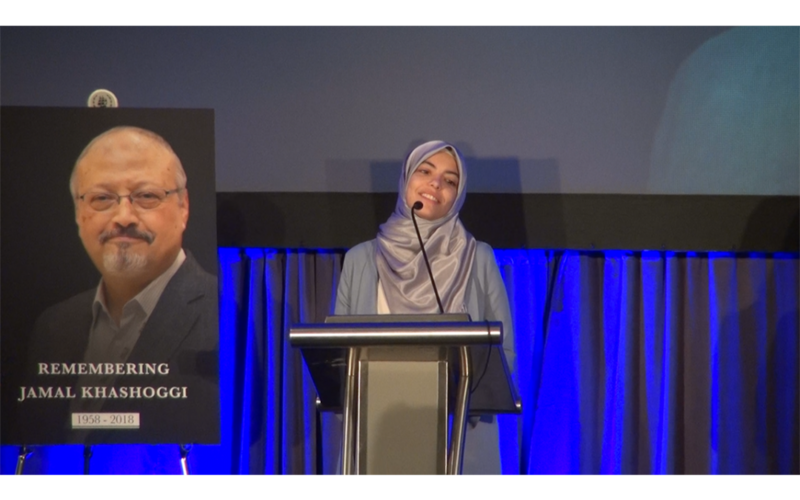 He didn’t advocate the overthrow of his government,” recalled Rep.
efforts to apply global pressure on Saudi Arabia to return her fiancé’s remains. Khasshoggi’s body and discover who committed his murder.